Identical twins Diana and Dana Khzouz, 20, have more than looks in common. They both study English literature at the same university and have the same friends. They even finish each other’s sentences. 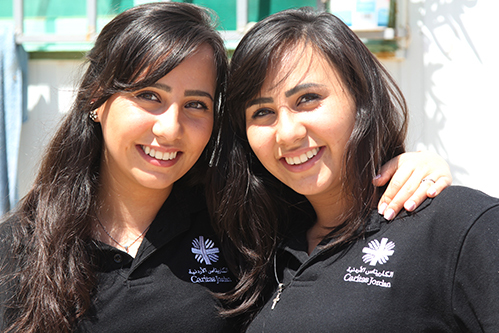 And they both do volunteer work through Caritas Jordan, putting them at the forefront of their country’s response to the influx of refugees from Iraq and Syria. 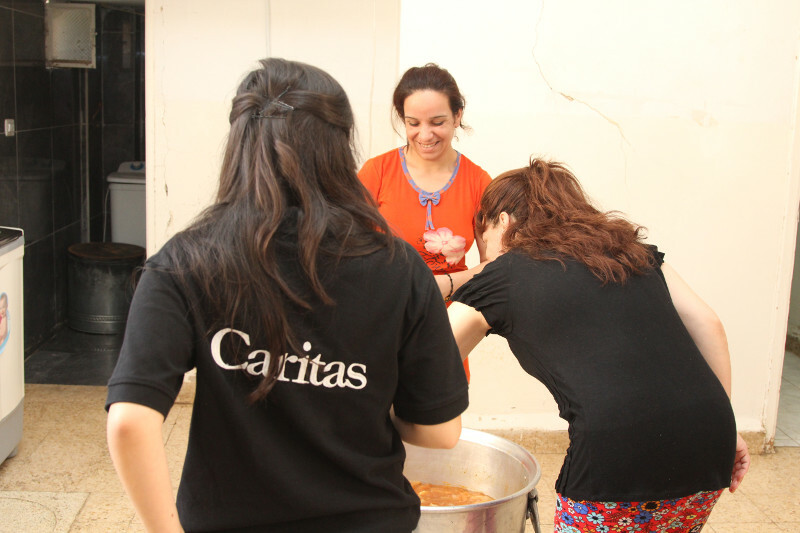 Catholic Relief Services works through Caritas Jordan to support Syrian and Iraqi refugees, including funding Caritas Jordan’s volunteer program—a vast network of more than 1,500 people. 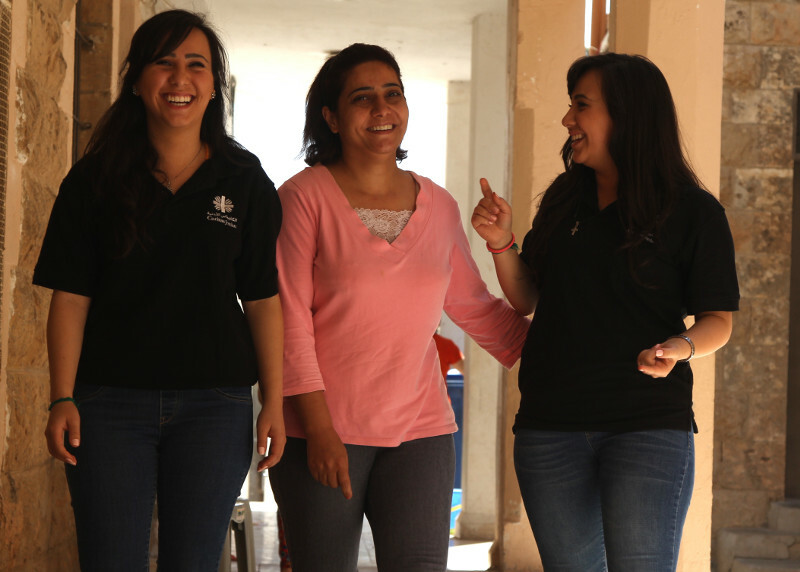 The church where the sisters volunteer, in Madaba, Jordan, is one of 14 Iraqi refugee shelters supported by CRS. In the past year, these churches have become home to thousands fleeing ISIS. For Iraqi refugee Dunia Afram Ishak, who lives at a CRS-supported shelter with her three daughters, Diana and Dana have become lifelines. Dunia, from Mosul, says the twins remind her of her dearly missed sisters, who have sought refuge in other countries. The importance of volunteers like Diana and Dana has grown in recent years—along with the country’s refugee population. Bordering Syria and Iraq, Jordan is now home to as many as 1.5 million refugees, straining government resources. In fact, some volunteers are also refugees, turning their experiences into motivation to help others like them. “Syrian refugee volunteers play a critical role in building trust and acting as liaisons to the refugee communities,” Ryan says. Watching the twins interact with refugee families is like watching good friends work together. During a recent hour-long stretch, Diana and Dana did everything from tying kids’ shoes to helping in the kitchen to visiting with a group of women. “Maybe we can’t give them money. But we can give them support,” Diana says. With thick, black shoulder-length hair and warm smiles, the sisters are mirror images. Although Diana can be more reserved, Dana has a forceful presence. They use their strengths to better the lives of those they help. And to do that, they rely on each other. “If there are problems I can’t deal with, she can,” Diana explains, pointing to her sister. The twins have befriended many of the Iraqi refugees they've met at the shelter, including Dunia Afram Ishak, center. "When I first met them, we immediately felt like a family,” she says. As the Syrian and Iraqi conflicts drag on, some Jordanians have become less receptive to the refugee population. The hope is that the growing cadre of volunteers will foster a mutual sense of peace, security and solidarity. Dana and Diana have experienced this firsthand.